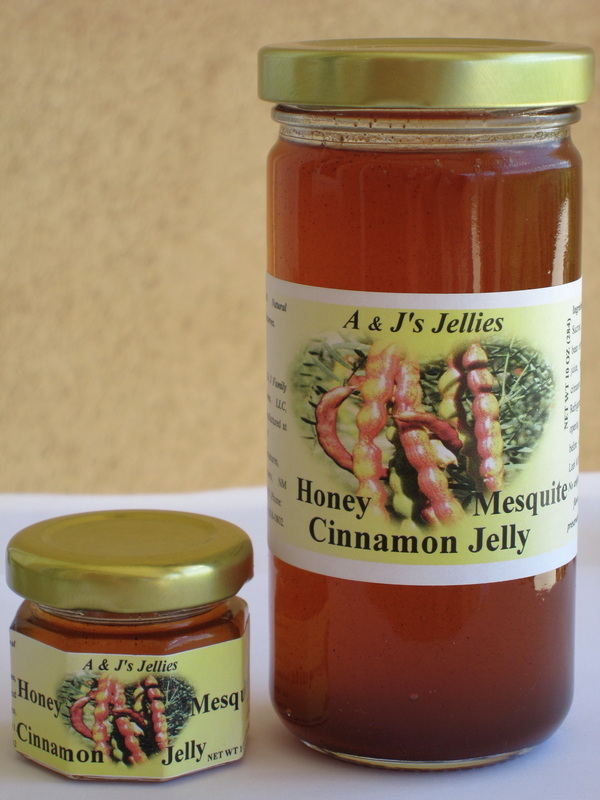 Our mesquite bean jelly is made from the pod (known as a mesquite bean) of the mesquite tree. Pods are harvested when they are mature and dry. The pods are broken and boiled; the liquid is pale yellow and is used to make the mesquite bean products. Mesquite bean jelly has a light yellow color with a unique flavor. It is Al’s all-time favorite jelly. Many customers say it has a honey flavor, but there is no honey in it. Mesquite bean jelly makes the best peanut butter and jelly sandwich on the face of the earth. We use it on toast, bagels, English muffins, cornbread, flour tortillas, sopapillas, and fry breads. We spread it on waffles and pancakes. We use it as a glaze on pork and chicken, and in hamburgers and meatloaf. Price listed including shipping cost. Our mesquite bean red chile jelly has some bite to it. It is not real hot, but is considerably warmer than its green chile cousin. The jelly still retains the marvelous mesquite bean flavor while adding some chile heat. We use it as the plain mesquite bean jelly, but highly recommend it as a glaze on pork, especially spare ribs, chicken and seafood.  Price listed including shipping cost. 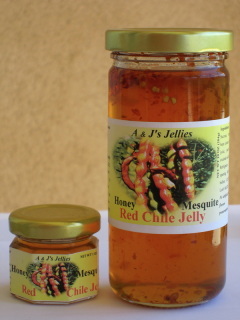 Numerous customers requested chile jelly. 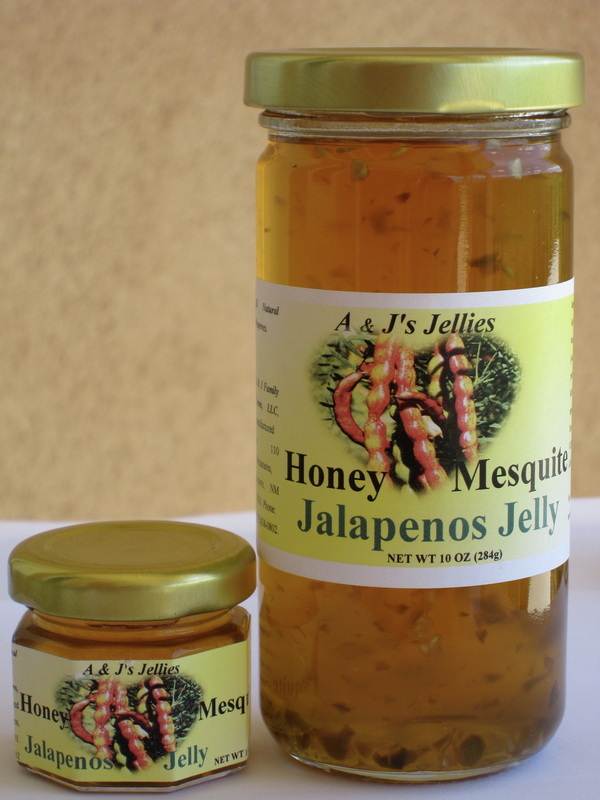 Since mesquite bean jelly is compatible with so many foods, we added some NM Hatch green chile to the mesquite bean jelly. Oh, my! Our green chile jelly is very different from chile jellies made by others. Ours retains the flavor of the mesquite bean jelly while providing the delightful flavor of green chile. 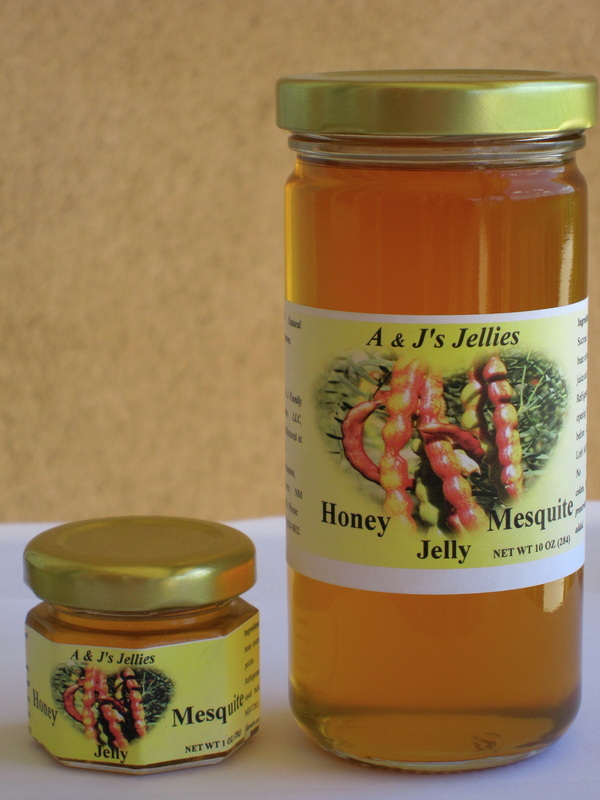 In addition to using it as we would the plain mesquite bean jelly, we also use it more frequently in cooking. We add it to our hamburgers, meatloaf, or use it as a glaze on pork, chicken and seafood. Price listed including shipping cost. 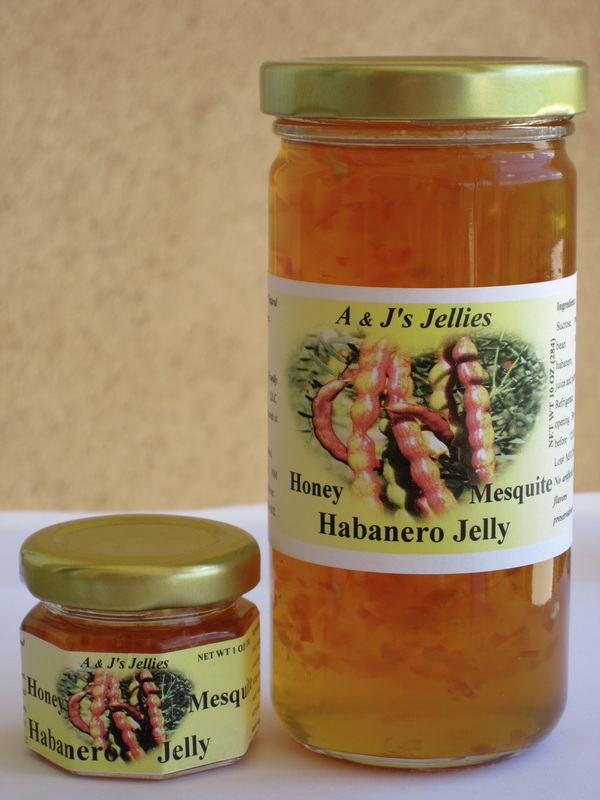 Most New Mexicans love jalapeños, so let’s add it to our mesquite bean jelly. It is an excellent mixture of mesquite bean flavor with a taste and some heat of jalapeños. As with our other chile jellies, the jalapeños taste is not overpowering. Just perfect! It is just right for jalapeño lovers. We use it in cooking as well as we would the plain jelly. Price listed including shipping cost. The color and texture of this jelly is as delightful as is its apple pie like flavor. What a perfect jelly for cinnamon lovers. It makes wonderful sandwiches, and is more than fantastic on pancakes, waffles, French toast, toast, bagels, English muffins, etc., etc. Price listed including shipping cost. This is our most recent development. 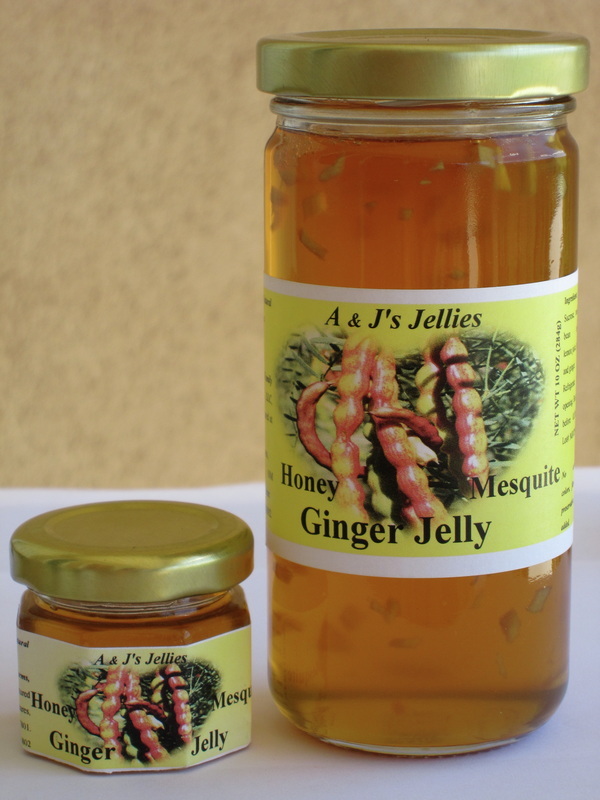 When it appeared that we at the end of developing mesquite bean jellies,, the idea of fresh ginger root in our mesquite bean jelly seemed logical. Wow! Pieces of finely diced fresh ginger are suspended in this colorful jelly. The color and flavor is unbelievable. Price listed including shipping cost.